The reason why COWS GO MOO is because they have trouble getting their tongue around saying the letter N. If it weren't for this unfortunate speech impediment we'd understand that they were trying to say MOON (hence the endless repetition of MOO, MOO, MOO). 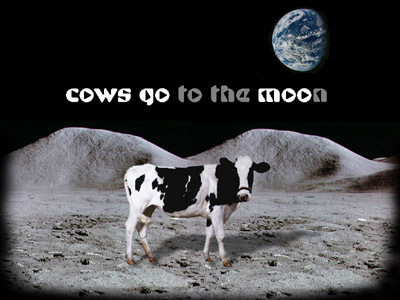 Cows, or COSMOCOWS as they prefer to be known, have been exploring the lunar surface for years. Their hooves are perfectly adapted to the dusty lunar surface and COSMOCOWS have learnt to use their ears as stabilisers. The surface can be somewhat tricky to traverse but a quick flick of the tail can correct a slip of the hoof. Everyone knows the MOON is made of CHEESE and that the cow JUMPED over the MOON but few are aware that today a herd of about 6,000 COSMOCOWS live on the GREEN crater, close to the Mendeleev crater on the FAR SIDE. They are quite independent and wander around looking for things to chew. From time to time, they encounter strange and interesting objects. Flags left by humans make excellent SCRATCHING POSTS. Leisure interests include GOLF and racing the LUNAR ROVER.